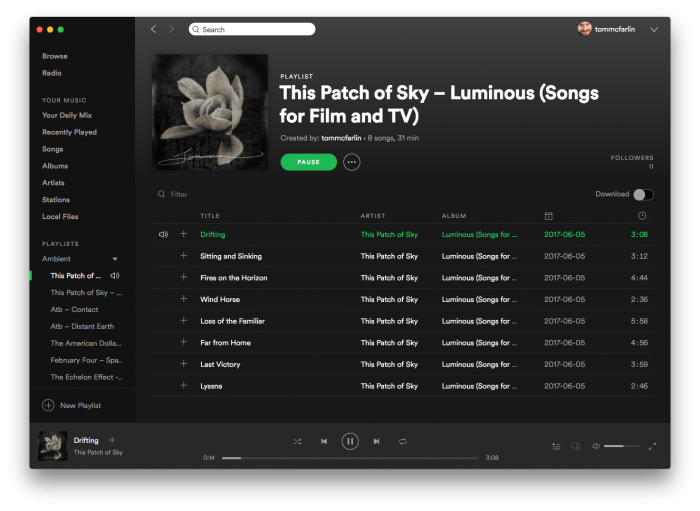 Towards the end of last year, I shared a list of Spotify playlists for work that seemed to garner a good response if for no other reason than offering up some additional things to check out on my own ). Since a few months have past and I’ve had a chance to listen, evaluate, and come up with a few more playlists to share I thought why not share another list? So just as I shared towards the end of last year, here’s a list of the ambient music or the soundtracks I’ve been listening to as of late. Like most, I don’t like one type of music. But when it comes to trying to focus on writing (be it words or code), I’ve found myself most productive whenever I’m listening to soundtracks or ambient music. Anyway, so here are some of my favorite ambient Spotify playlists for getting work done. If any of these links don’t work, don’t hesitate to let me know. Otherwise, enjoy. I don’t know when this happened exactly. From high school through my early 20s, I was almost listening to some type of classic rock or punk rock – and I still do – but not when I work. And I guess I should really say “rarely” when I work because I’ve begun mixing it up a bit lately. But it doesn’t matter because that’s not the point of this post, right? Instead, here you go: Five more Spotify playlists that you can add to your list (or start your and that you can spin whenever you’re focused on getting work done. Clearly, I’ve begun to turn this into a periodic thing (hence the whole Volume 2 in the heading), but I’m also interested in whatever it is you have to share, too. Feel free to link ’em up in the comments.